Compared with SharePoint On-premises, in SharePoint Online - viewing items in lists, and viewing item properties, opening or downloading documents are not available because of storage and performance concerns. How to Enable Auditing in SharePoint Online? In Site Settings page, Click on "Site collection audit settings" under Site Collection Administration. Specify audit events for "Documents and list items" and "List, libraries, and sites" by enabling check box to audit events such as "Editing items", "Deleting or restoring items", etc. Click "OK" to save your changes. 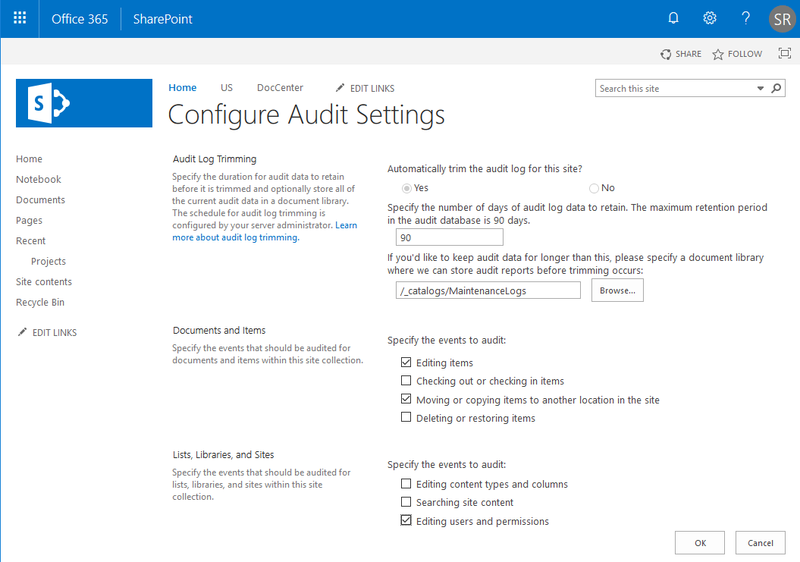 This enables auditing for the SharePoint Online site collection. Once auditing is enabled, You can get auditing reports through "Audit log reports"link in Site collection settings page. Auditing is configured at site collection level. When you have a large number of site collections, enabling auditing through web UI by going to each site collection would be a tedious job. So, lets use PowerShell to enable auditing in SharePoint Online for all site collections. write-host -Foregroundcolor Red "Error Enabling Audit for Site Collection $($_.Exception.Message)"
$AuditFlags="ChildDelete, ObjectDelete, Undelete, Update, Move, SecurityChange"